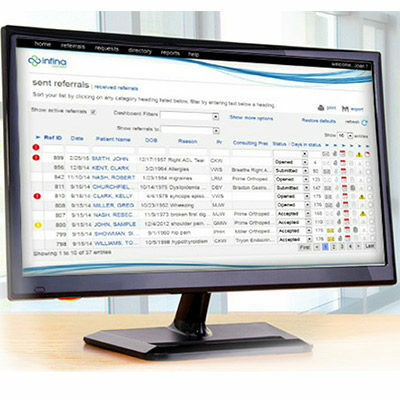 Empower virtual collaborative networks one referral at a time. ICC ties together your accountable care vision with real world execution. Once you identify your high value referral partners, your administrative teams need a way to send, track, and manage referrals with those partners. At the practice level, ICC reduces the time it takes to manage the referral process by as much as 80%. Better communication and coordination translate into better care at a lower cost, faster treatment, and more satisfied patients. With a spotlight on network referral patterns, accountable care executives can now gain insight into targeted opportunities to decrease costs and contain leakage. Take control of cost at the point of entry. ICC has a proven ability to deliver a greater than 80% success rate for keeping patients within high value networks. Stay in consistent communication with your high-value network leveraging ICC’s bidirectional communication and document sharing capabilities. Predictive analytics are great, but not real time. Use the referral as the problem indicator and appropriately respond to save money and reduce risk now. ICC was the first referral coordination solution to be adopted by a majority of providers across a major metropolitan area. ICC allows organizations to customize their referral partners based on their initiative and/or individual insurance plans, including specialists, post-acute providers, behavioral health, and others who should be part of your team. As part of its basic functionality, ICC can automate the creation of referrals from any certified EHR. The system pre-populates both clinical and administrative fields from a CCDA plus has the ability to attach supporting documentation such as images, labs results, etc. Infina Connect also has a unique technology that enables bidirectional certified and non-certified EHR integration with ICC without the need to involve the EHR vendor. ICC provides a centralized referral dashboard that gives an instant snapshot of the referral status of ALL patients and enables clinicians to coordinate referrals based on acuity of patient need. ICC enables mutual status, real-time, secure messaging, and notifications from any provider, any time related to the patient. Intelligent Care Coordinator (ICC) is a referral management solution that enables organizations to reduce patient leakage within their high value referral networks, a key enabler of success in achieving upside and minimizing downside risk under value-based agreements. ICC receives patient data directly from the EHR to begin the referral process, making it easy for office staff to use within their day to day workflow. Primary Care Providers can then guide patient referrals to high performing providers, ensure that relevant clinical information is shared, maintain visibility into ongoing status, and collaborate with consulting provider offices bi directionally. Contact us today for a complimentary workflow and strategic initiative Discovery Call. Built for patients. Designed for clinic staff to execute on the strategic goals of accountable care leaders. An implementation process that’s proven. A support team you can trust. At Infina Connect, we believe that our success is completely driven by the success of our customers. As a Software as a Service (SaaS) solution provider, we’ve worked hard to ensure access and training orientation is simple and straight forward. Whether an individual practice or enterprise entity with an expansive network, communicating the change to your organization and community partners is critical to your success. Our team is here to walk beside you through the entire process. Meet Bo Bobbitt, a nationally recognized thought leader in the transition to value-based healthcare delivery systems and teams. He is head of the health care group at the Smith Anderson Law Firm (www.smithlaw.com ) and President of Value Health Partners, LLC (www.vhp.care) utilizing both platforms as appropriate to assist providers, their networks and innovators on their journey to value-based care success. He regularly speaks and writes for national audiences. In this webinar, Bo shares his perspective on one of the key elements for ACO financial success. Start building your high value network today!